It has been said that the GC Signature Series cigar was originally blended to suit the personal taste of Kristoff owner Glen Case. Whatever the reason behind this creation, we think you're really going to enjoy it. The GC Signature Series is beautifully constructed with a blend of Cuban-seed Dominican and Honduran fillers and Honduran binder wrapped in a sweet, dark Brazilian Maduro. The profile is rich with flavors of espresso, cocoa, and spice, ending with a sweet finish of mixed berry and dark chocolate. Another great addition to the Kristoff lineup, the full-bodied GC Signature Series cigars should be on your 'must smoke' list. 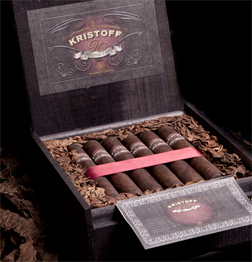 These cigars are nestled in loose tobacco inside the unusual rough-cut cedar box now synonymous with the Kristoff brand.